IUG Arabic center has recently witnessed a wide demand from non-native speakers to learn the Arabic language through the newly launched online platform. The center has started receiving many daily inquiries about the nature of courses and the curricula offered. This comes as a result of launching an electronic book to teach Arabic to non-native speakers, entitled "Arabic From Palestine" for beginners, which included in the OPAC project, in partnership with the University of Glasgow, funded by the Council of Human Research and Arts AHRC in Britain, and With support of the UNESCO Chair for the Integration of Refugees through Languages and Arts, in which the Islamic University participates. 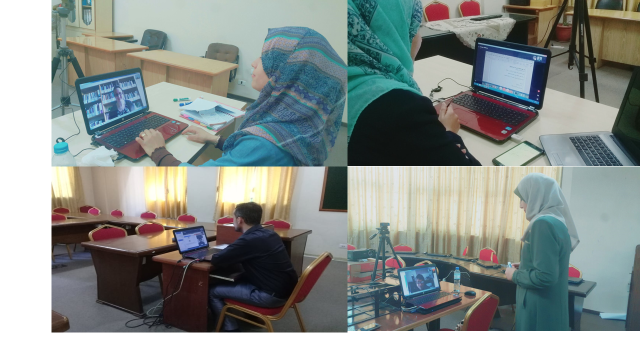 A number of beginners' students have joined the Center to learn Arabic through "online Arabic from Palestine ", which introduces the Arabic language from a Palestinian culture point of view and allows learners to know more about the Palestinian heritage through the image and video. Over the last six months, the Center has held (26) Arabic language courses; (16) courses have currently been held at various levels. Most of the learners are from Britain, Italy and the United States, working in the field of journalism and teaching in addition to some graduate students and students of Middle Eastern studies. The Project Director Prof. Nazmi Al Masri asserted that the work is underway in cooperation with the University of Glasgow to provide some qualitative projects to develop Arabic language programs through electronic curricula using the most appropriate methods of teaching Arabic to non-native speakers. In addition, Prof. Al Masri mentioned that the importance of teaching the Arabic language from Gaza is to widely spread the Palestinian culture and increasing awareness of the Palestinian issue using various social communication techniques, as well as, promoting the culture of education and distance work, which reduces the unemployment among graduates in Palestine.